IBV GmbH, an engineering company for the electronics industry, has been your competent partner for industrial electronics for more than 25 years. Due to our long-time work experience and in-depth knowledge in the areas of industrial electronics, aerospace technology, telecommunication and automotive engineering we are able to tap the full potential of every job we are entrusted with. Thus, a successful cooperation between our partners and IBV is ensured. Our aim is to consistently offer you optimum solutions to cater to your specific requirements. All under one roof – meaning a competent (and permanent) contact person for you. Our customers also automatically benefit from our products’ fast delivery period. Employees are successfully recertified to ECSS-Q-ST-70-08C to produce highly reliable spacecraft solder connections. 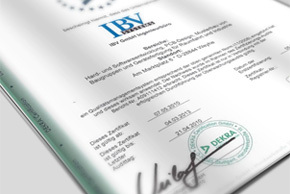 IBV is now also certified according to the new ISO 9001:2015. 09.10.2018 Read more … IBV is now also certified according to the new ISO 9001:2015. IBV employees work with the new Rework System IR/PL 550 from ERSA to place and repair electronic devices. Copyright © 2014 IBV GmbH. All rights reserved.